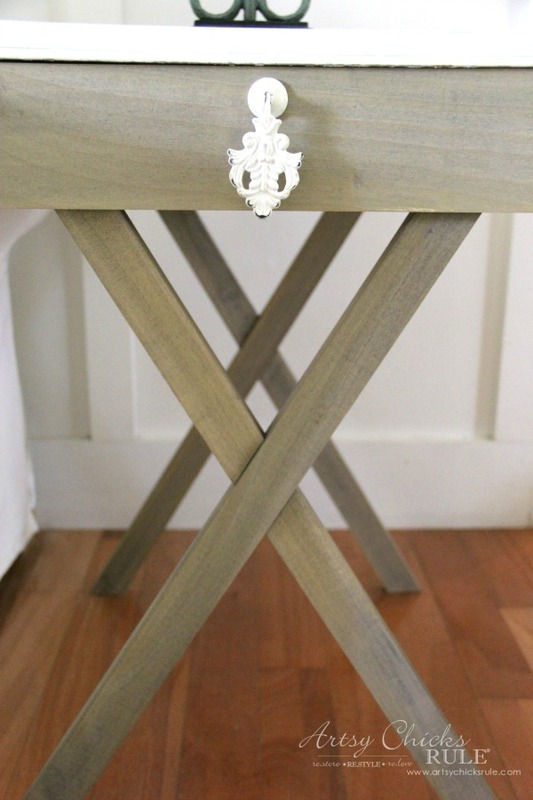 Make your very own DIY criss cross end tables! See the reveal today! My Trash to Treasure girls and I are back to share some fun new makeovers with you guys this month. 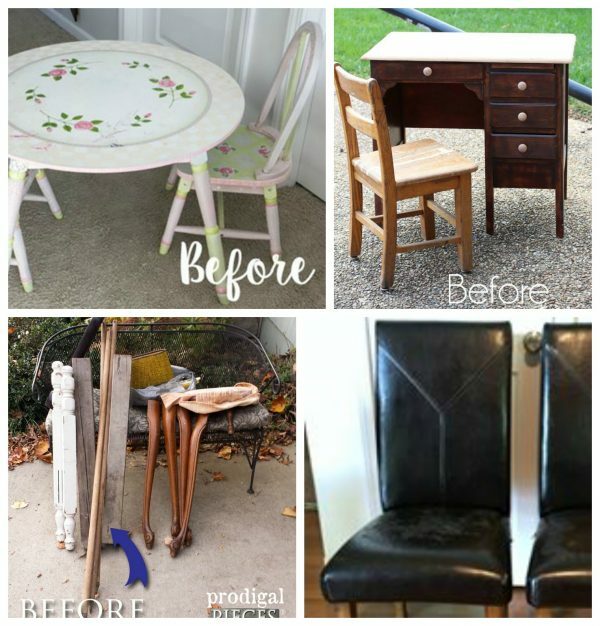 You might remember some of my previous trash to treasure makeovers here…. 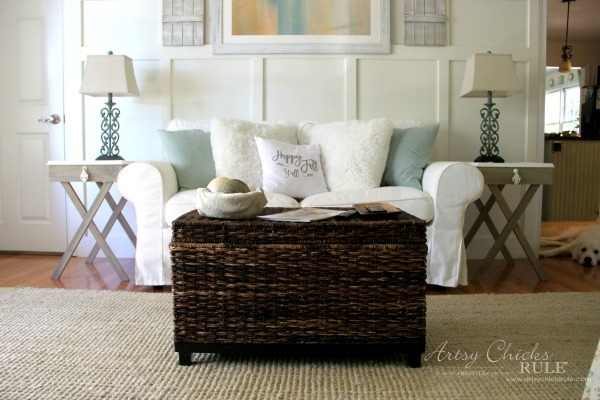 The reason I shared those two specifically is because I used that same idea to create two criss cross end tables for our family room out of these…. 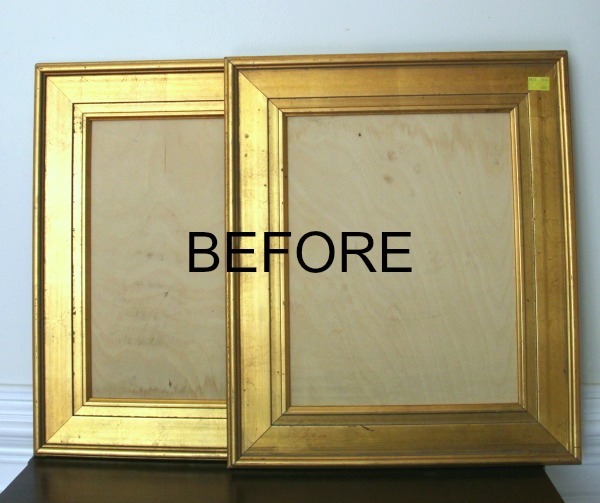 ….two frames I found at the thrift store. Which, by the way, I totally forgot to take a photo before I got started. This was after I had glued in the base for the tiles to lay. The frames were empty when I bought them. 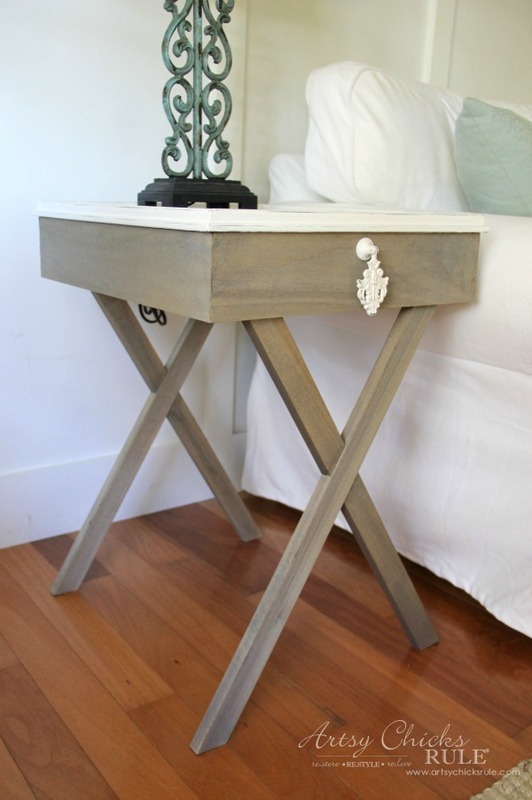 Here’s the criss cross end tables my husband and I made…. They were pretty simple to make minus angles and such. That’s never fun but it is doable! 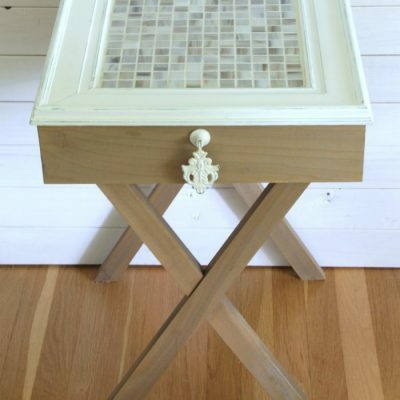 I created the tops for these criss cross end tables with the same tile I used in one of my other trays I linked above. I thought the colors would be perfect for the family room. Plus they sort of have a “shell” look to them. As you can also see, I painted the frames too. If you follow along on Instagram, you saw me as I was doing all of this! I shared each step in my “story” over there. Sadly those only last for 24 hours so are no longer available. So be on the lookout for that tutorial post. UPDATED: You can see it now, HERE! If you aren’t already, you can also sign up to receive my newsletters so you won’t miss it. 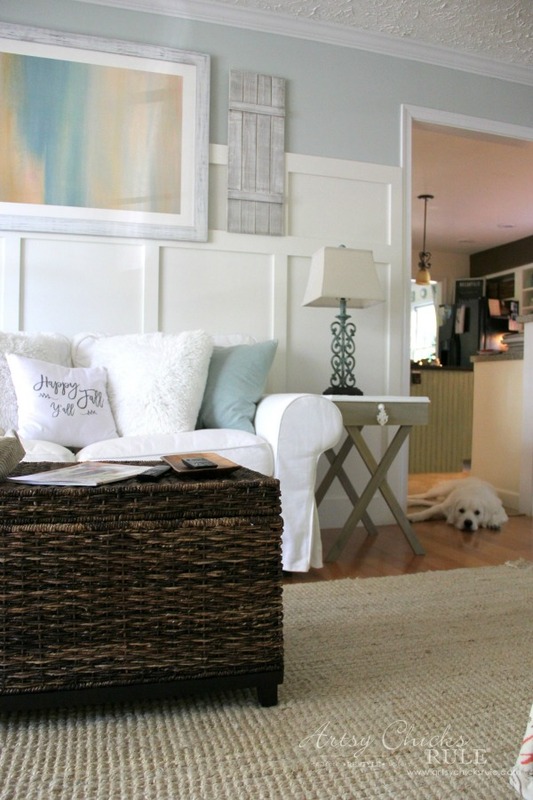 This is one of the reasons I wanted to put a love seat in this space instead of a large couch. I’ve never been able to have end tables on each side like so. Although, I think the lamps I bought are going back. They don’t seem to work for me in this space. I think the “scroll” pattern is a bit too much with the curtains, etc. I’ve also considered moving the artwork and shutters down a bit. They seem high since I put in the new couch. I have also considered putting a long sign just under the artwork too, instead. We’ll see! Probably not until after the holidays. So, just to give you an idea of what they will look like with lamps, I included them. And without so you can see the top better….. 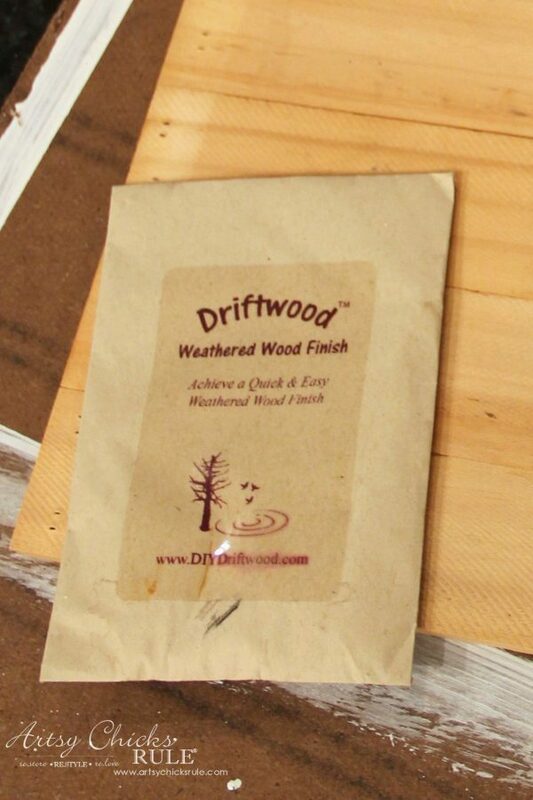 I wanted the base of the tables to look like weathered wood so used one of my favorite products…. You can find it here …. (affiliate link, disclosure here) …. Best Driftwood Stain Ever! I also wanted them to be casual and not clunky. And the reason why I chose criss cross legs giving them a relaxed, open feel. I originally thought I’d put a drawer in but wanted to keep it simple, so didn’t. 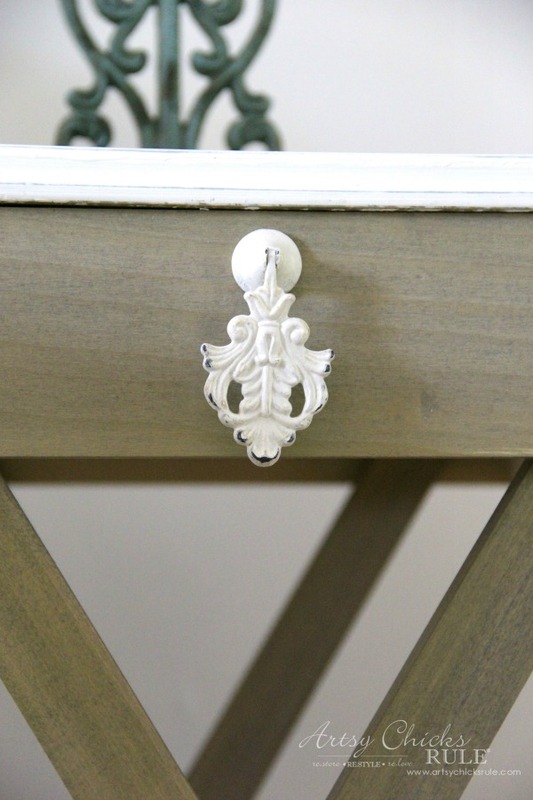 But I did include a cute handle so it would mimic a drawer. I am SO happy with how these criss cross end tables turned out! UPDATE! You can see the “how-to” now, >>> here! Now let’s see what my friends made over this month …. What a fantastic upcycle! I love the simple lines and versatility of them, Nancy. The could go in any room. Kudos to you and your husband! Really nice. Love that finish – did I miss the name of the color you used? Do you mean the gray/brown bottom half? Thank you – I looked at the package and decided it was part of the brand name. This little table came out great! 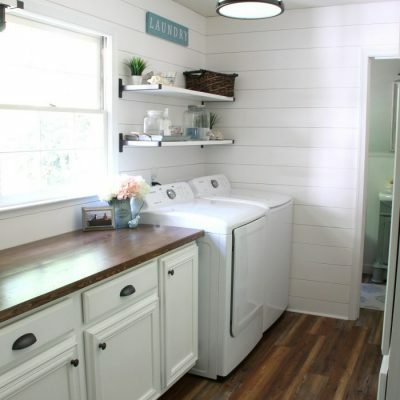 I love the tiled top. So pretty! Beautiful tables, Nancy! I love how you used the frames on top. Your space is coming together perfectly. Love how they turned out! 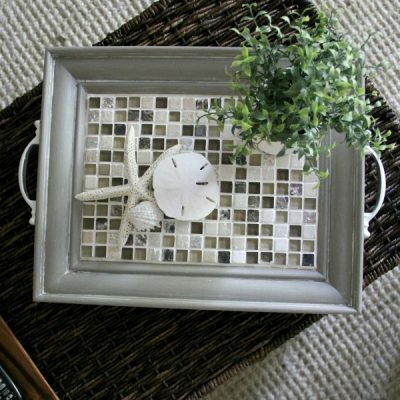 I just got a frame and mosaic tiles to make a tray, hope it comes out as well as yours do. I recently passed up a really big frame, too big for a tray, but it would make a great table top. The lamps are beautiful, but I agree with you that you need something chunkier in there – maybe some ceramic beanpots? Oh fun!! Please share a photo (if you like) after you’re done. Would love to see! Those tables are awesome, they look like you bought them at a high end store. I personally like the lamps there. 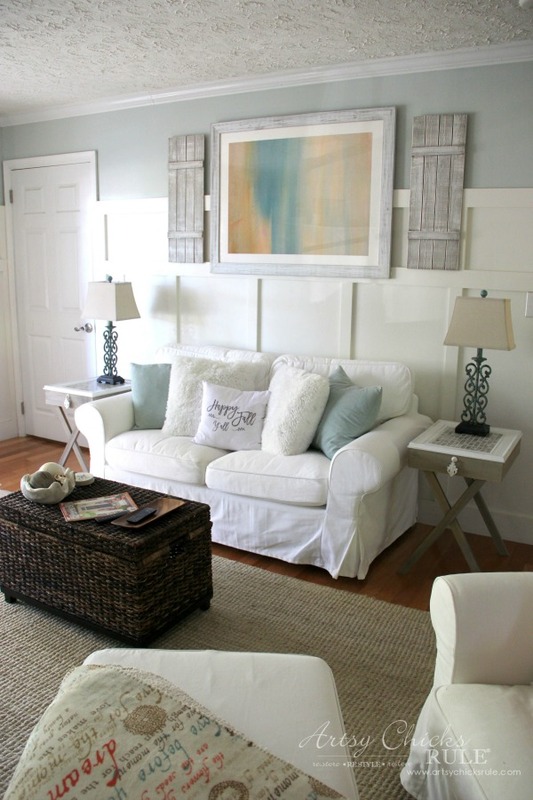 I also, like you, immediately thought of adding a sign under the mirror to “connect” the art to the sofa..isn’t the rule of thumb approx 6″ above furniture to keep the art from floating? If the light hits you in the eye when you are sitting on the sofa, the lamps are too high. Love all your projects, and thanks for posting them. I’m hoping a sign under will look okay since I’d rather not move all of that if I can help it!! First of all, your puppy is adorable!!!! Second, I love, love, love the tables you made. Gorgeous!! I love them!! I love your new tables. 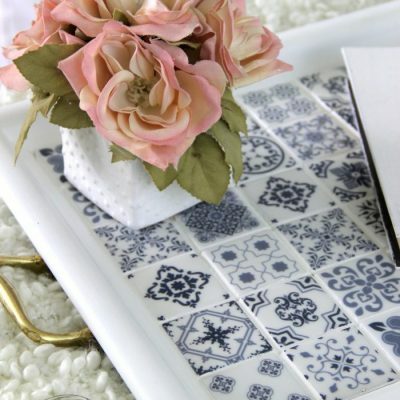 The tile work is so pretty. I personally like the art work above your new love seat. I think the height is perfect. 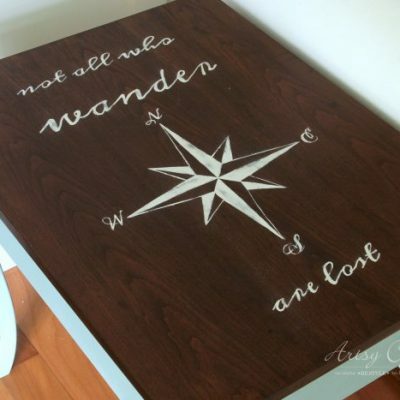 Love the tables! 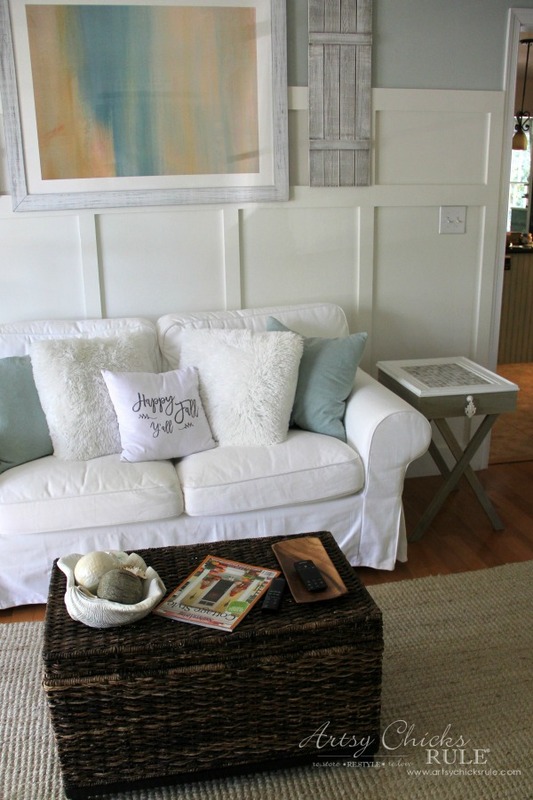 I use a love seat too in my space so that I can have side tables. As I’m sitting here at my computer that is sitting on an old silverware storage box that I have painted and distressed I noticed that we have used the same hardware!! How fun! I love those handles! And yep, I like the lamps but just not in the room. I’m sure it’s only a matter of time. 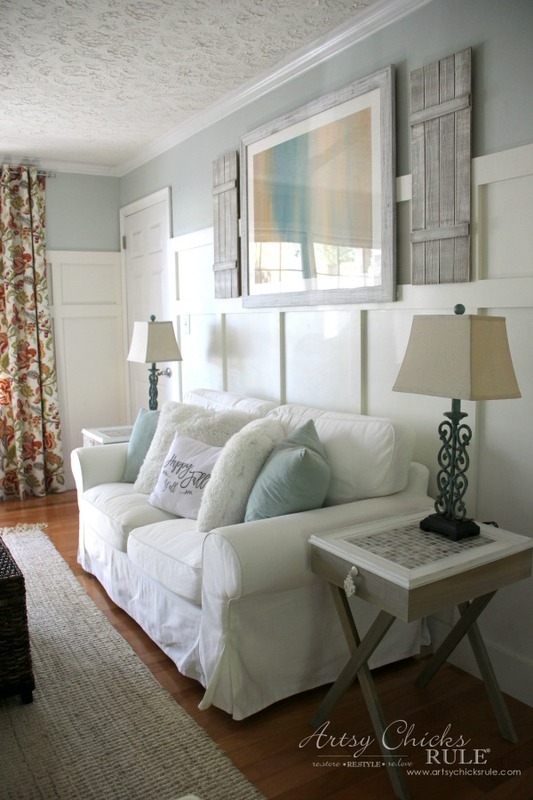 But no really, I knew I was painting the wall that color when I made those curtains. They have several shades of blue in them but hard to see well in the photos. I know they are a little crazy and bright though. 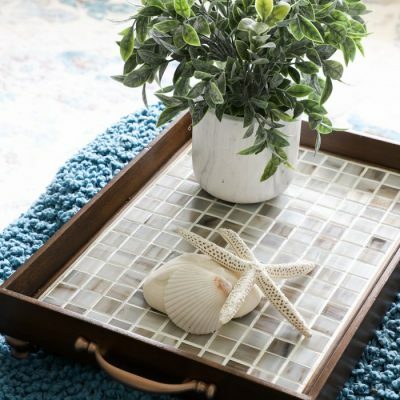 Hi Nancy, I have a question; did you fill the space between the table top and the the top of the frame with mortar to lay the tile on? I’m going to have a full tutorial upcoming on the blog. It will have all the details for everyone. :) But in the meantime, no, if you take a look at the “before” photo of the frames you can see the base for the tiles. It was glued directly to the frame and then the frame was attached to the box that is the bottom of the table. Hope that helps! Be on the lookout for the tutorial. I’m hoping to get it in before the holidays but it may be January before I can get it done. Your tables are fantastic. So coastal and beautiful. I think your painting is hung sideways. Was that intentional? It is a Lise rendering of a shore line. rotate it to the left one turn. 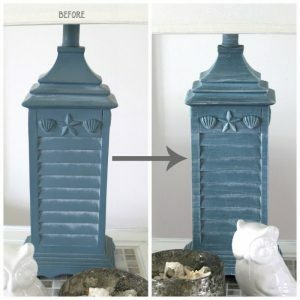 Such a great upcycle! 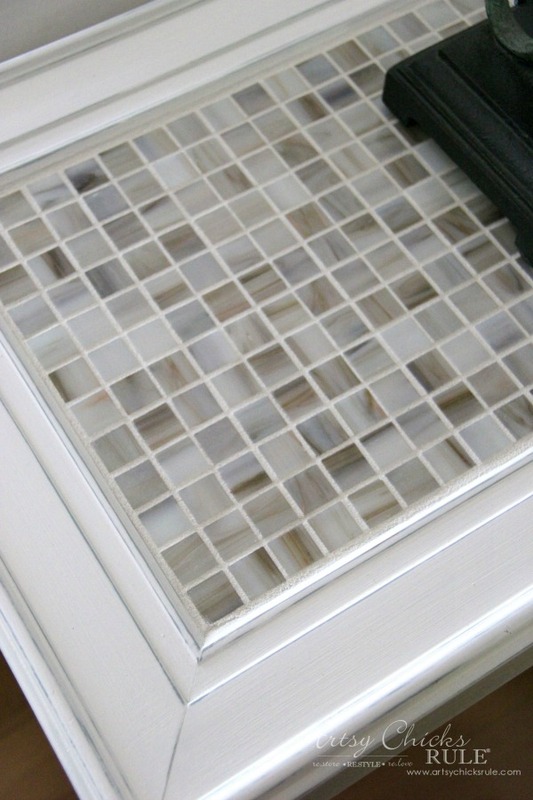 I wonder if it will be cool to use tv trays and frames to get this look? 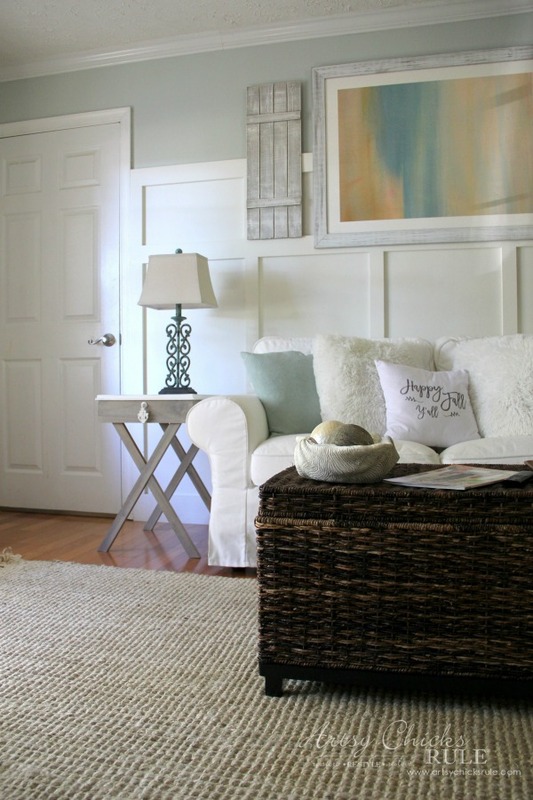 The end tables look just right on each end of your loveseat. I agree with you about the lamps — too fussy. What about a pair of clear glass lamps that you can fill with shells? Thanks Sandra! :) and thanks for the suggestion too!